The Fantastically Creepy Mr. Foxcatcher. Near the conclusion of Bennett Miller’s Foxcatcher, a character is effectively forced to speak words he fundamentally does not believe. “John Dupont has been a mentor to me,” he reluctantly states. He’s being asked to participate in a puff piece documentary about the billionaire wrestling fan who has re-fashioned himself as a wrestling coach, and making a quick assessment of the situation, he realises he has no choice but to convincingly deliver the lines of dialogue that have been fed to him. It’s in his best financial interest – and perhaps even the interest of his personal safety – just to repeat the lie. The only way he’ll even acknowledge his discomfort is via little facial tics and flashes of hesitation. He knows, instinctively, that he does not want to cross John Dupont. Miller’s retelling of the tragic true story of the eccentric DuPont family scion (Steve Carell) and the pair of Olympic wrestler brothers in whom he takes an interest (Channing Tatum and Mark Ruffalo) is full of such moments in which the overwhelming power of money silently stifles any dissent. Dave and Mark Schultz have already tasted Olympic success, each having won a gold medal, but they’re also only scraping by. Reaching the pinnacle of their sport does not translate into financial success, you see. Mark (Tatum), subsisting on a diet of Ramen noodles and fast food in a small apartment in Wisconsin, receives a mysterious phone call from the assistant to a man named John Dupont. Dupont’s assistant invites Mark to come to the Dupont Pennsylvania compound to discuss a matter of some urgency. It turns out the oddball patriot wants to match the resources the Russians spend on their athletes, in the pursuit of wrestling gold at the next Olympics. He believes Mark is the wrestler to do it, and proposes to immediately begin funding a state-of-the-art training regimen that includes world-class facilities and a sparring team of his own choosing. Mark’s brother Dave (Ruffalo) resists the sweet deal, however, creating rifts with both Mark and Dupont. Soon after moving in to a private home on the property, Mark realizes Dupont has personal designs on him, seeking someone who will see him as both a friend and a father figure. Unfortunately, simmering somewhere behind Dupont’s preternaturally even-keeled demeanour and staccato speech patterns is a quiet rage – the kind that finds its outlet through shooting ranges and buying massive artillery from the military. 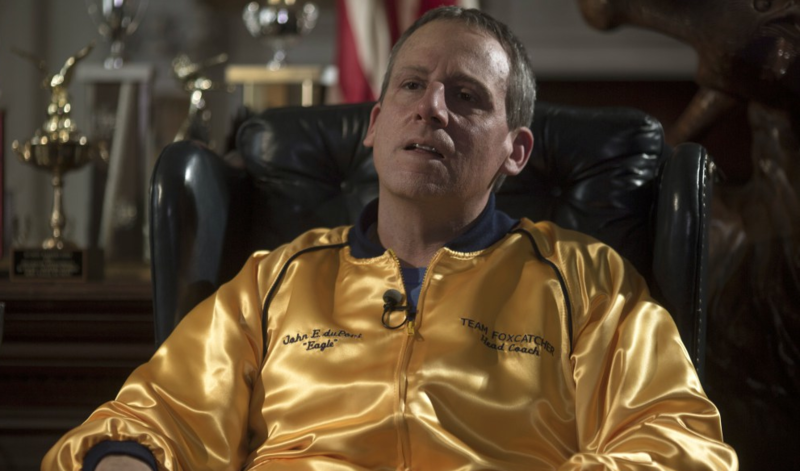 Foxcatcher’s two most noticeable traits both belong to Steve Carell. One is his absurd prosthetic nose, which is really more of a beak, and the other is our utter surprise over the weirdness of his precise, career-best performance. Having worked primarily in comedies and dramas with comedic elements, Carell might never have been considered a match for this dark and humourless material, which tasks him with being consistently disturbing. Yet his is not the only remarkable transformation in Foxcatcher, which also gives Tatum a pair of cauliflower ears and Ruffalo a pronounced hunch and receding hairline. All the actors have been gnarled into the saddest and most desperate versions of themselves, in a film where no man can meet the expectations others have of him. That’s one thing Mark Schultz and John Dupont have in common: they both put themselves on a path to ruin by trying first to impress, then to distance themselves from, an older family member. Mark has been living in the shadow of the older Dave, who is widely considered the savvier athlete, without whom Mark’s success is not considered possible. Dupont struggles with his own familial demons, as his aristocratic octogenarian mother (Vanessa Redgrave) looks down her nose at him and disdains his love for such a “low” sport. Although Dupont is ostensibly this film’s villain and Mark the hero (or at least the protagonist), both characters bear responsibility for engineering their own undoing. The film makes a strong case for their psychologies dictating their actions, while resisting the urge to spell anything out explicitly. The toxic dynamic that crops up among these three men is characterised by imperceptible shifts and moments of deceptive significance. While Foxcatcher does many things right and is buttressed by focused and memorable performances, it’s one of those films that invites such descriptors as “cold” and “clinical.” These weird true-life news items often make their way to the screen more as curiosities than as complete narrative journeys with tight structures. At the end of Foxcatcher, there’s a bit of a sense of “These things happened – so what?” Still, those who appreciate the dedication and discipline of wrestling will find those twin attributes on display among these three actors. Sometimes, watching fine actors at the tops of their games is reason enough to “catch” a particular movie.